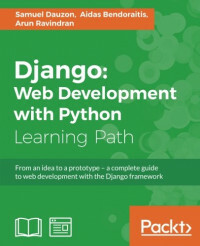 Web developers who want to use modern Python-based web frameworks like Django to build powerful web applications. The course is mostly self-contained and introduces web development with Python to a reader who is familiar with web development concepts and can help him become an expert in this trade. It's intended for all levels of web developers, both students and practitioners from novice to experts. Data science is hot right now, and the need for multitalented developers is greater than ever before. A basic grounding in building apps with a framework as minimalistic, powerful, and easy-to-learn as Django will be a useful skill when launching your career as an entrepreneur or web developer. Django is a web framework that was designed to strike a balance between rapid web development and high performance. This course will take you on a journey to become an efficient web developer who thoroughly understands the key concepts of the Django framework. The first module, Django Essentials, is a practical guide, filled with many real-world examples to build highly effective Django web applications. In the second module, Web Development with Django Cookbook, you'll learn varying complexities to help you create multilingual, responsive, and scalable websites with Django. The next step is to discover the latest best practices and idioms in the rapidly evolving Django framework. This is what you'll be learning in our third module, Django Design Patterns and Best Practices. By the end of the module, you will be able to leverage the Django framework to develop a fully functional web application with minimal effort. There is very little specialist literature available on IMAP servers, and no current documentation deals with the subject in sufficient depth. Cloud computing has become a significant technology trend. Experts believe cloud computing is currently reshaping information technology and the IT marketplace. The advantages of using cloud computing include cost savings, speed to market, access to greater computing resources, high availability, and scalability.